It’s been a tough week. Nothing to do with my illness (although I did have a ct scan on Tuesday but that’s another story). Daisy has had a bad week for ‘meltdowns’. I don’t know what brings them on or why some days are worse than others. What I do know is that they’re horrible, exhausting and stressful. Normally it’s an item (or 2) of clothing that doesn’t feel right that upsets Daisy. She gets very frustrated and cries. It’s hideous to watch. There’s nothing I can do to calm her down. She cries that she needs help, she begs me to help her. But, when I go near her, she shouts at me to leave her alone, that I’m making it worse and that I’m not listening. Now I know she doesn’t mean any of these things she says but it’s absolutely heart breaking to hear. There is nothing I can say that will help. I feel helpless as all I can do is watch and wait for it to pass. It’s like watching a monster trying to break out from inside her. Her eyes are looking at me, you can see the desperation in them but her mouth belongs to someone else and is just hurling abuse. It’s so upsetting. You just have to ride them out. Today’s lasted 2 hours and 20 minutes – a new record. We’re always late for school on these mornings although that makes her worse. She hates people looking at her and being different. On occasions she says that she hates her life, that she wants to die. She gets so angry. I feel helpless as her mum. I should be able to make it better. Instead, on weeks like this, I dread waking up in the mornings. I’m shattered. She’s shattered. It’s funny how quick the black mist descends. The mist that is always there, suddenly gets thicker, shrouding you as you wander happily along, minding your own and making the best/most of things. Enveloping the fun times, the positivity, the progress. Now you can’t see to go forward. Everything seems against you and you struggle to see the point. It’s like walking through treacle. Everything takes so much energy. There’s an overwhelming feeling of sadness, of feeling beat and at the end of your tether. All tinged with anger. Why me? What did I do? Why? Why? Why? There is no answer. All you can do is sit it out. It’s tiring but you muddle through the days. Waiting, willing for it to be time for bed. To be able to close your eyes and shut everything out. Morning comes too soon. You wait patiently for the mist to clear and to see that glimmer of hope and sparkle shine through again. It will. It always does. 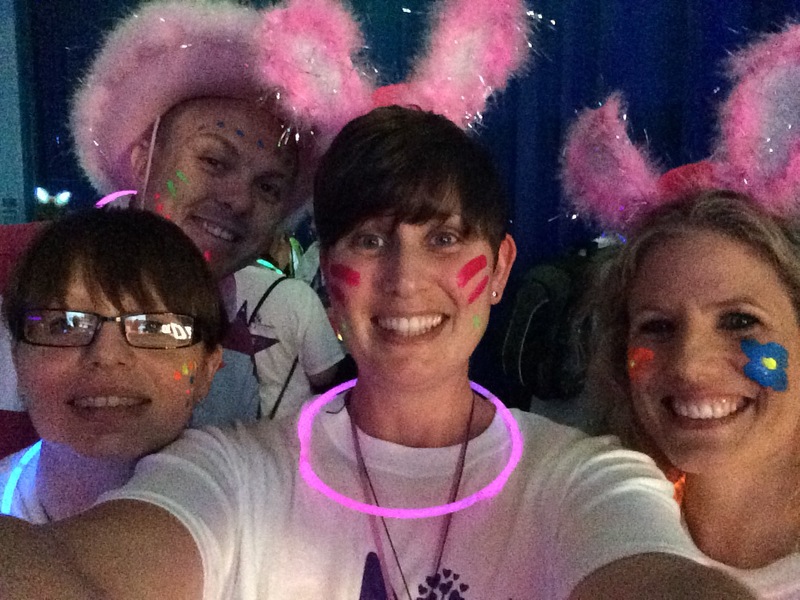 Last night I took part in the Hospice of St Francis midnight walk. I was supported, as always, by a team of fantastic friends. I couldn’t do it without them. I only did the 5 miles and realistically that was all I could have done. It was much more of a struggle last night than when I did the half marathon. I think the fact it was way past my bedtime didn’t help! Plus my hip has been giving me jip for a few days. The atmosphere was fantastic. The theme was ‘glow for it’ and glow we did!! Everyone made such an effort and some of the costumes were amazing. We were given chocolate (which I scoffed before mile 1 was out! ), glow sticks, water and at the halfway point, mint cake. Dan scoffed 2 of these and then spent the 2.5 miles back feeling rather nauseous!! We got back in about 2hrs 25 minutes, not that I’m bothered about time. Slow and steady. 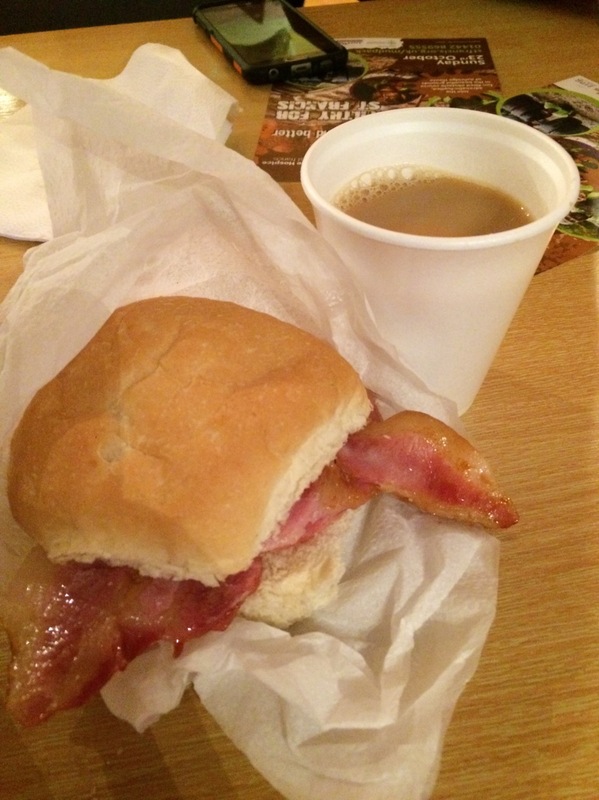 The bacon roll and cuppa was a welcome sight (even if there wasn’t any brown sauce Michelle). The thing that struck me the most was the ‘message’ wall. 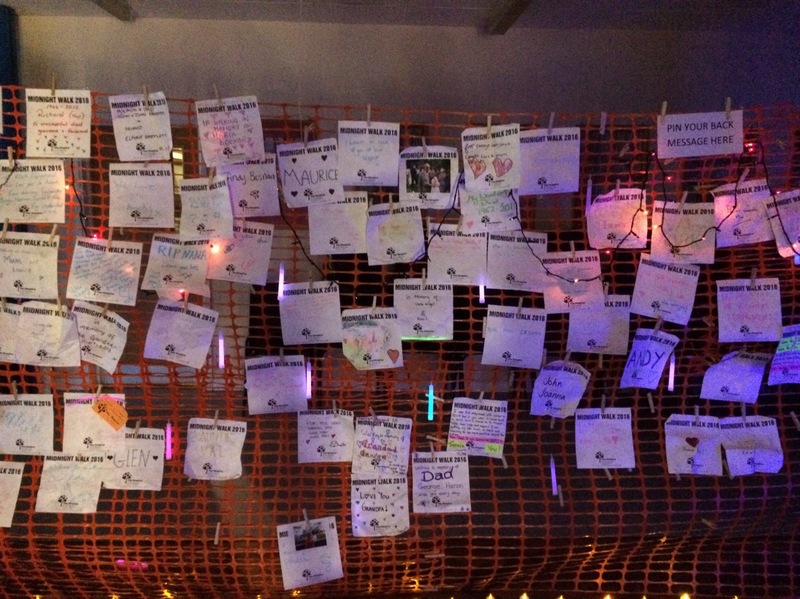 Everyone pinned their messages from their t-shirts to the wall and it was just so poignant. A time to reflect. It really blew everything else out of the water. It makes you realise not just what’s important, but who. Easy Does It went and done it! Today I completed my first (I would say ‘and last’ but I don’t think it’s going to be!) half marathon. Myself and my super supportive team mates came together and walked the 13.1 mile route in 4 hours and 40 minutes. We each did over 34,000 steps and burnt over a 1000 calories. I’m proud of myself for getting to mile 10 before I started to struggle – I always hit the wall at 6 miles on my practise walks. Maybe it was the amount of jelly babies I ate!! Nothing could dampen our spirits – not the rain, the blisters or the crazy woman in the car that ranted at us for closing the roads (don’t ask!!) Although she angered us so much so that we sliced about 3 minutes off of our mile timing because we started walking faster!! The atmosphere was amazing. It certainly didn’t feel like we’d been walking for all that time but I was really relieved to see the finish line on the horizon. We all held hands to cross the line together. I really didn’t want the day to end but we all said our goodbyes and headed home for hot baths. I’m sitting in bed now because I’m in quite a bit of pain. I can’t even lift my left leg so have been dragging it behind me like something out of the Zombie Apocolypse. But I’m not moaning. 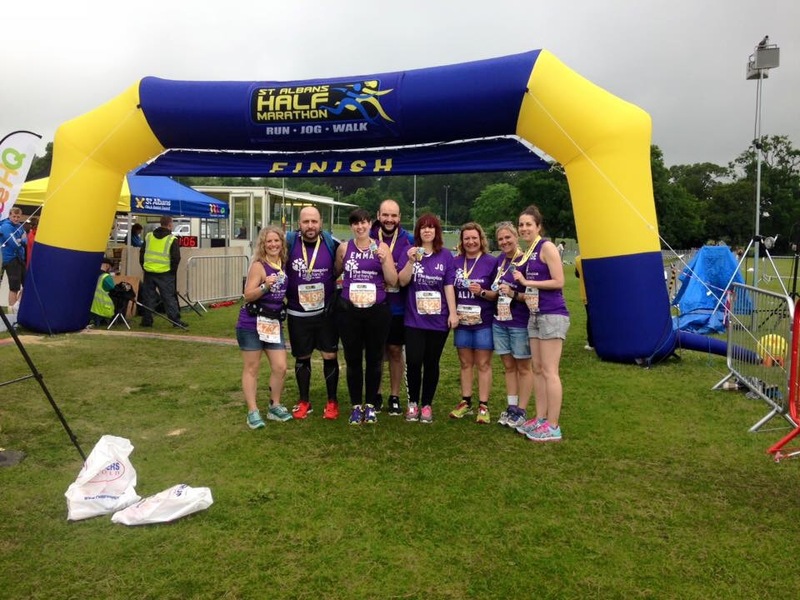 I had a fantastic time and we raised over £2000 for the Hospice of st Francis. Definitely worth it. It’s us against the bullies! Today I feel like I have fed my Daughter to the lions. She used to love going to school but that has been ruined by a few individuals who think it’s ok to make her life a misery. Bullies. She got upset this morning (the second time this week and it’s only Wednesday!) because her skirt was too tight. I knew it wasn’t about the skirt. Just like it wasn’t about the socks on Monday. She got angry, cried and hit herself. It took everything I had to not cry. I know it’s not the answer but I gave her the option of staying at home. She wanted to go to school. Once there, it took a good 40 minutes to get her to leave me. I just wanted to take her home, to protect her, to make it better. Ive had meetings with the Head and I even asked if it is something she is doing to make the other girls pick on her? The answer, of course, was no. In fact the only thing the Head could pin it on was the fact that she’s a very quiet, solemn little girl and perhaps the children can’t ‘read’ her?!! Still no excuse for bullying. I was bullied at secondary school and I know first hand just how miserable it makes you feel. As a result I too hated school. I didn’t go very often. There’s no excuse for it and normally it’s because others are jealous. I was older and could think more logically. Daisy just sees things in black or white. There’s no grey area. I’ve told her to ignore them. She did yesterday and as a result ended up playing on her own. This breaks my heart. You send your children to school expecting them to receive the same level of care they would get at home. You don’t expect them to feel alone and sad. I have kept quiet so far but I’ve had enough now. This has been going on since last October. My Daughter is sad, withdrawn and hating her life. She’s 9. This is not acceptable and I will not stand by and watch what should be the best days of her young life get any worse. If you’re reading this, I hope you’re proud of your children! This is something I never imagined I’d have to write about. It’s also something that doesn’t just affect me. It seems that there are lots of people having the same trouble. Blue badge battles. I parked in a disabled bay today at my local tesco. I displayed my badge, as you do, for everyone to see. As I walked away from the car, a lady behind me started to explain very loudly, to her children, the rules of the mighty blue badge and how it can be revoked if you misuse it. Now I’m guessing that this conversation was in fact aimed at me. Because I don’t ‘look’ disabled. I have all my limbs, I can walk unaided and I ‘look’ just as healthy as the next person. This woman looked at me and came to the assumption that I was misusing my badge. It’s not the first time it’s happened either. I’ve had elderly ladies shouting through their car window at me telling me I can’t park there – it’s for disabled people and others waving their blue badges at me excitedly only for me to wave mine back, all the while smiling and saying ‘up yours’ through gritted teeth. People are far to quick to judge, to jump to conclusions. I feel awkward and embarrassed when I do park in a disabled bay. It’s no wonder really!! I feel like I need to put on a bit of a limp just to please the crowd. 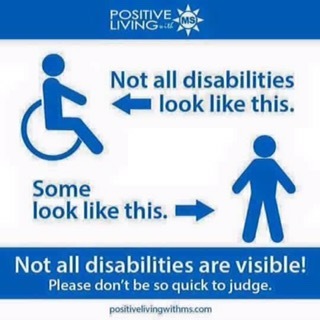 But the truth of the matter is, not all disabilities are visible. You can’t see the pain I’m in or how exhausted I am. Some days I can walk from the furthest corner of the car park and other days I can’t. So this is to everyone who has questioned me. I don’t need to explain my reasons for having a blue badge to you but I would like to quote an age old idiom – “never judge a book by its cover”.